Pegasus is probably the most famous creation to appear in the tales of Greek mythology with the imagery of the winged horse still used in modern advertisements and emblems. Pegasus was not born in the normal manner although it might be said that the horse was an offspring of Poseidon and Medusa. Medusa was once a beautiful maiden, and a priestess in one of the temples of Athena. The beauty of Medusa was such that Poseidon forced himself upon the priestess in Athena’s temple, and as a result Medusa became pregnant. Athena found out about the sacrilege that had occurred in her temple, and of course she was unable to take out her rage upon Poseidon, and so Medusa became the focus of her hate. Medusa would be cursed with the ugliness associated with the monstrous Gorgon, with hair of snakes and a stony gaze, and Athena also cursed Medusa so that she could not give birth to the offspring conceived in Athena’s temple. Medusa would make her new home with the other Gorgons, but eventually she was tracked down by Perseus who had been quested with bringing back the head of Medusa. Perseus would manage to approach Medusa, using his shield to protect him from the Gorgon’s gaze, and with his sword, Perseus cut off the head of Medusa. Medusa would fall down dead, but from the severed neck sprang forth the children of Medusa, Pegasus and Chrysaor. Pegasus emerged as a fully grown winged horse, whilst Chrysaor, Pegasus brother, either emerged as a giant or a winged boar. It has become to think that Perseus then made use of Pegasus in his long return journey to the island of Seriphos, rescuing Andromeda from the sea monster in Aethiopia from the back of the winged horse. 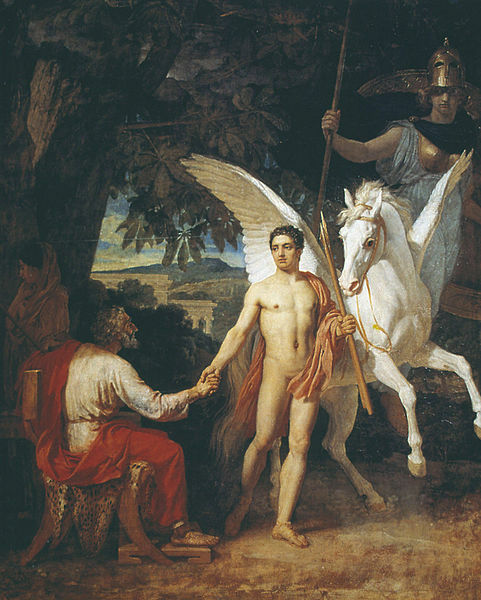 The use of Pegasus by Perseus though was an interpretation of the myth that occurred in Europe many hundreds of years after the original stories had been recorded. Perseus, in the original Greek myths, had no need to use Pegasus, for he already had in his possession the winged sandals of the Greek god Hermes. There is a gap in the mythology of Pegasus after the birth of the winged horse, but eventually Pegasus is to be found upon Mount Olympus in the care of the goddess Athena. It was said to be Athena who tamed and trained Pegasus making it rideable by mortals. Pegasus would be housed in the massive stables of Mount Olympus, alongside the various chariot pulling horses of gods such as Helios, Poseidon and Zeus. Zeus would indeed be the god to make the most use out of Pegasus, and Pegasus would become a weapon carrier of Zeus, sharing the role with gigantic eagles, and it was therefore Pegasus who often carried the thunderbolts crafted by the Cyclopes when Zeus went to war. Some stories tell of Pegasus finding himself a mate in the form of Ocyrhoe (also known as Euippe). Ocyrhoe was the daughter of the centaur Chiron who had been transformed into a horse by Zeus, when she had revealed too much about the future, especially about the fate of her own father. 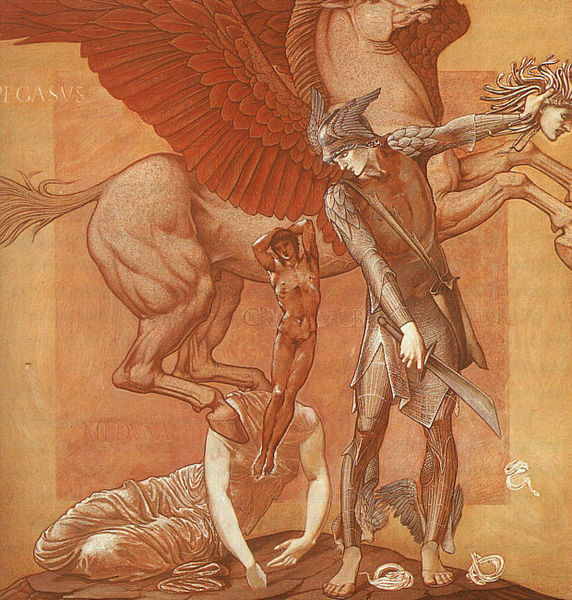 Pegasus and Ocyrhoe were said to have mated bringing forth Celeris, and possibly Melanippe, although Melanippe was another name given to Ocyrhoe. Some tell of these offspring of Pegasus being the forefathers of a new race of winged horses, also Celers was not necessarily a winged horse, and often is just described as being swift of hoof. In later mythology, especially in later Greco-Roman mythology, Pegasus would become associated with the Younger Muses. 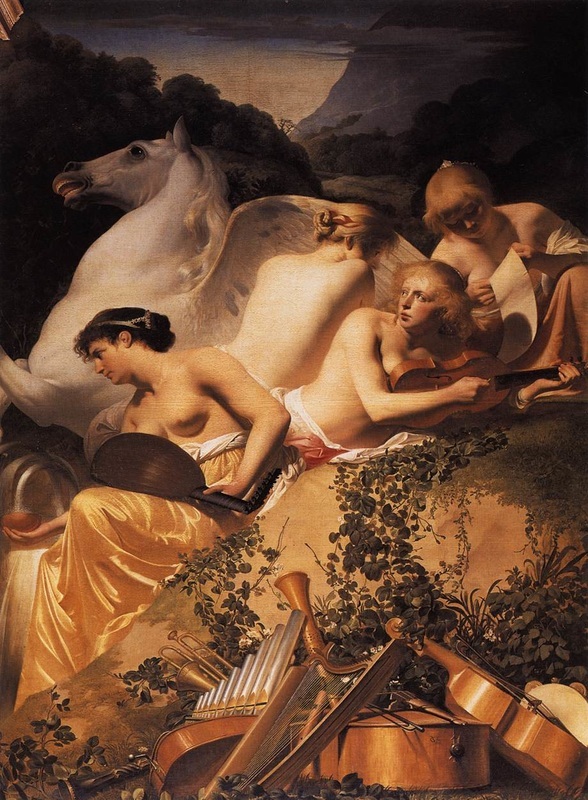 One particular story of Pegasus and the Muses comes about when the Muses undertook a singing contest with the daughter of King Pierus, the Pierides. The song of the Muses was so good though, that the mountain upon which they stood, Mount Helicon, swelled in admiration for the work. Poseidon ordered Pegasus to gallop over Mount Helicon to relieve the mountain’s swelling, and where the galloping Pegasus touched down a spring was created, the spring being named Hippocrene. Similarly the creation of other sacred springs around Ancient Greece was said to have occurred when Pegasus touched down. In Greek mythology, Pegasus is primarily known for one tale which sees the winged horse used by the hero Bellerophon. Bellerophon had been tasked with killing the Chimera, the fire breathing monster of antiquity. Bellerophon knew that the task would be much easier if he could attack the Chimera from the air and the hero figured Pegasus would allow him to do so. Bellerophon would ask the seer Polyeidos how he could catch Pegasus, and the seer advised to hero to spend the night in the temple of Athena; and in the temple the goddess came to Bellerophon. Athena gave Bellerophon a golden bridle and told Bellerophon he would need to make a sacrifice to the god Poseidon, this Bellerophon did, and subsequently the hero found Pegasus drinking from the Pirene well upon the Acrocorinth. Pegasus saw the golden bridle, and recognised it as one used by Athena, and so Pegasus allowed Bellerophon to put it on, and then allowed the hero to climb upon its back. The riding of Pegasus did make it easy for Bellerophon to best the Chimera, but his victory then gave the hero an overinflated sense of worth. 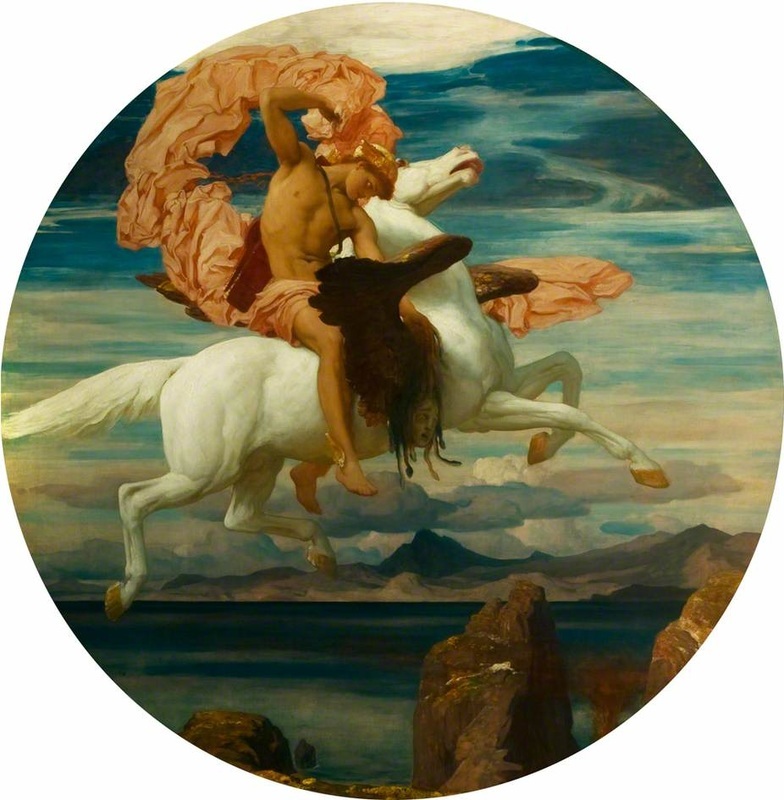 Thus, Bellerophon decided that he should make a trip to the palaces of the gods upon Mount Olympus. Such an action was seen as overly presumptuous by Zeus, and Zeus decided to stop Bellerophon. A gad-fly was dispatched, which subsequently stung Pegasus, and when the winged horse bucked in pain, Bellerophon was unseated. The hero fell to earth and was left a cripple, whilst Pegasus flew unencumbered back to his stable upon Mount Olympus.